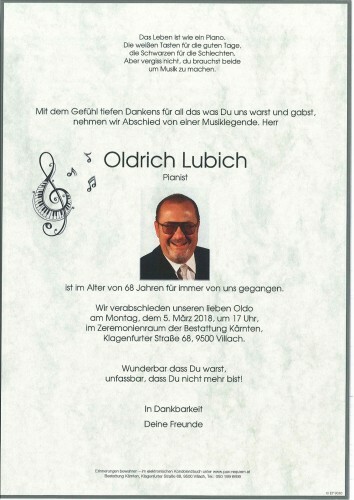 Lieber Oldo, gemeinsam musizieren ist wie etwas Lebendiges erschaffen, das die Welt verändert....danke Oldo, dass ich das mit dir erleben durfte. Danke für die Freundschaft und Hilfe . 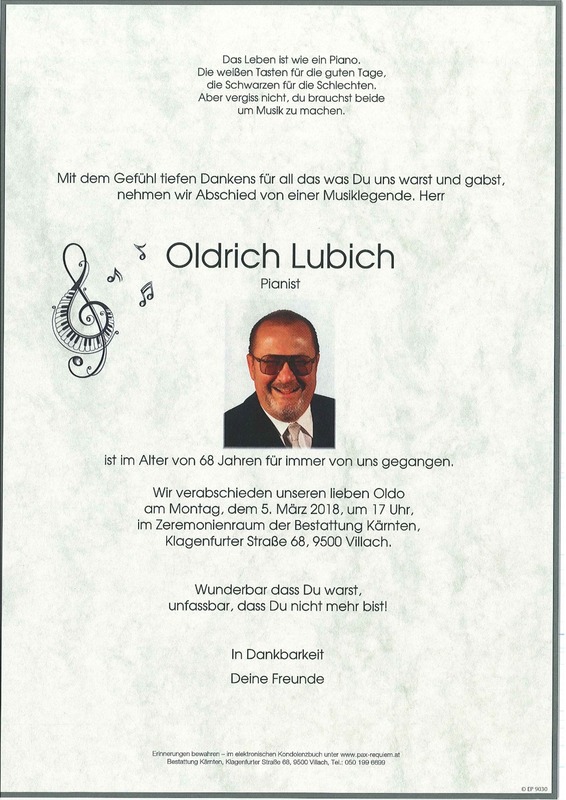 In unseren Herzen und auf unserer CD "Golden Memories "wirst du stehts weiterleben. TO THE VERY SPECIAL ONE THAT I LOST This is for my "beloved Maestro"...already in heaven... I can't explain if I'm sad or angry I can't describe what I feel right now Is it pain, is it relief for you? I just wanna say: Thank u for the moments u gave me, for the seconds u smiled, for the time I could b with you. For the million minutes you inspired me and made me happy with your unforgettable music which always b in my thoughts, in my mind and 4ever in my heart. I'm losing u. I'm losing someone special in my life who passed away. It's gonna take some time to realize that you're not here anymore. I'm gonna miss the evenings right next to u, listening to those melodies, which touched my heart. But now you're gone, like the moment when the rain has ceased. I'm broken I'm crying You're out of reach... Rest in peace, my dear friend! I will always b thinking of u whenever I sit at my piano, pressing the keys, praying to god that u r in good hands now. Oldo, u r always on my mind!! !